In 2015, ad agency Zulu Alpha Kilo released its hilarious ‘Say No To Spec’ campaign that instantly took off within the creative industry. The idea of working for free clearly hit a nerve not only among advertising personnel, but also photographers, graphic designers, and many more. 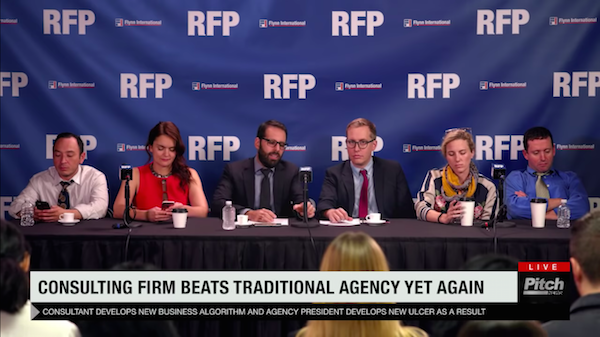 In this 2018 follow-up, the creative firm has debuted the ‘World’s Worst RFP’, which pokes fun at all the terrible ways to conduct an agency pitch. “RFP” in advertising refers to “Request for Proposal,” which is what the creative agency receives from a brand when there’s interest in engaging in its services. The RFP comprises the marketing goals and requirements for partnering with the creative firm. The film takes after the post-game media meetings frequently held in professional sports. Instead of athletes, the client sits with representatives from the winning and losing creative agencies before a crowd of reporters. Zulu Alpha Kilo has accompanied the video with an advice piece on improving the pitch process, which you can read through on smarterpitch.com. Others in the industry can share their thoughts on how the list can be improved via the social media hashtag ‘#smarterpitch’.